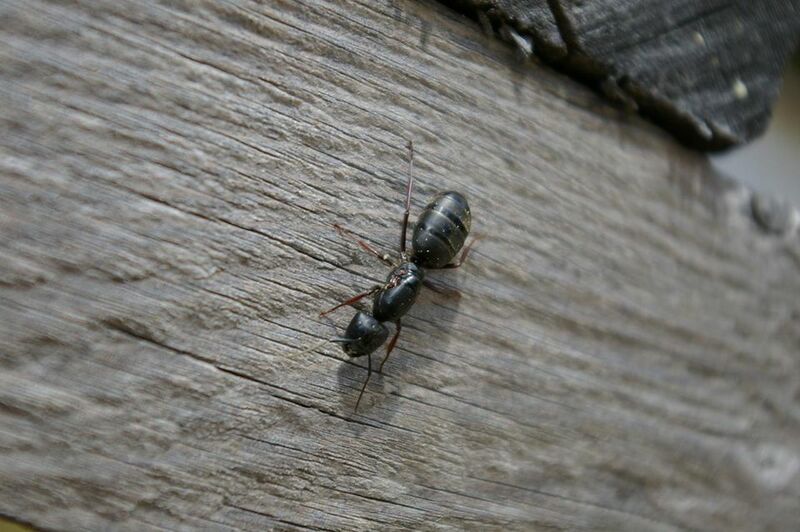 Carpenter ants can cause significant damage to a home without you ever seeing them. But because that damage takes place slowly, over time, you can identify carpenter ants and their damage, and control them. In the natural world, carpenter ants are important decomposers of forest trees, burrowing within it to nest and feeding on insects, plants and fruit juices. But they will move from their native woods to the structures of homes looking for water and human or pet food. Fortunately, there are several least-toxic options to control carpenter ants once they have been properly identified. Carpenter ants have humped backs, are about ½ inch long and are black with gray, yellow or red hairs on their body and legs. Carpenter ants are commonly misidentified, so it is advisable to consult a pest control specialist or your local university entomologist or Cooperative Extension Service agent if you are unsure whether it is carpenter ants that are infesting your home and yard. Frame houses without basements and any building near a forest are likely locations for a carpenter ant nest. Indoors: These nomadic ants love areas of high moisture, so when looking for them in your home, you should inspect bathrooms and kitchens, and anywhere water leaks are occurring. Check for wood dust or shavings, as these will be piled outside the entry hole to the colony in the wood. Outdoors: Tap on evergreen trees and hollow stumps that are within 300 feet of your home. You can use a stethoscope or empty glass to listen for rustling sounds. On the structure of the home, gently tap joists and rafters with a hammer, listening for rustling or for the hollow sound of excavated wood. If you think you have identified a carpenter ant nest, Insert a pocketknife blade into the wood to confirm your suspicions. If the knife easily penetrates the wood, it is likely that you have an infestation. Boric acid is used to destroy indoor nests and if kept dry, can be effective up to 30 years. Although it is non-toxic to human and pet skin, a one-micron dust mask, neoprene gloves, and safety goggles should be worn to avoid inhaling or ingesting the fine dust. Desiccating dust, such as diatomaceous earth (D.E.) and silica gel, destroy insects by absorbing their waxy outer coating, causing them to die from dehydration. D.E. should be blown with a bulb duster behind electrical switch plates and into wall voids. Silica gel combined with the natural pesticide, pyrethrin, is available in aerosol cans and should be sprayed into the same areas as D.E. Alternative, but not readily available, controls include microwave radiation, heat treatment, and electrocution. Check your telephone book or the Internet for contractors in your area. How Do I Keep Carpenter Ants Away? Borate-treated lumber must be used in any home construction or remodeling. All siding and foundation holes must be sealed and rotted wood replaced, especially next to drains and gutters — cap with metal any wood that contacts soil. Additionally, because ants (and other infesting pests such as ants and spiders) can live in cut wood, always store firewood outdoors, and bring in only the amount you will use at one time. Before carrying the wood indoors, shake it or knock it against another piece of wood to knock off loose bugs and get an idea whether other pests may be infesting the wood.